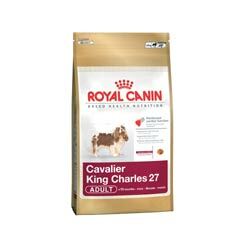 Royal Canin Cavalier King Charles Spaniel is specially formulated for the needs of Cavaliers. The adapted content of magnesium, sodium, potassium, arginine, EPA and DHA, taurine, L-Carnitine and antioxidants (Vitamins E & C, green tea and grape polyphenols have been specially chosen for Optimum Cardiac Function. The ingredients will also enhance your dog’s coat colour.